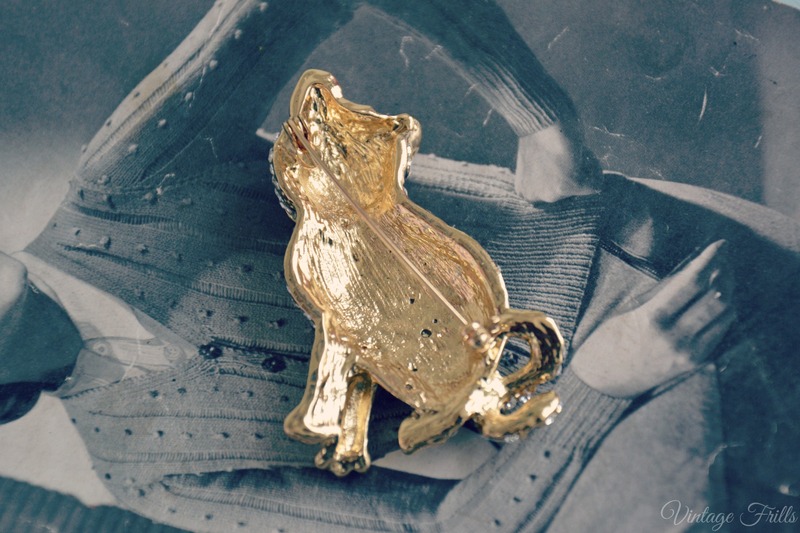 An Adorable Vintage Style Cat Brooch! We don’t wear brooches enough these days! I personally think a little brooch on a coat or cardigan can finish off an outfit nicely and I have quite a few that I’ve collected over the years, some are family pieces from my grandma and others I’ve picked up at vintage fairs and charity shops. Recently I’ve come to love looking through the #NoveltyBroochFriday hashtag on Instagram. Some of them gorgeous and some more eccentric offerings, they are a delight to behold! Until now I’ve not really owned any thing worthy of the Novelty title, all my brooches are pretty tasteful, pretty crystals, painted designs and embroidered pieces have thus far been the staples of my collection. I also don’t actually wear any of mine as often as maybe I should. 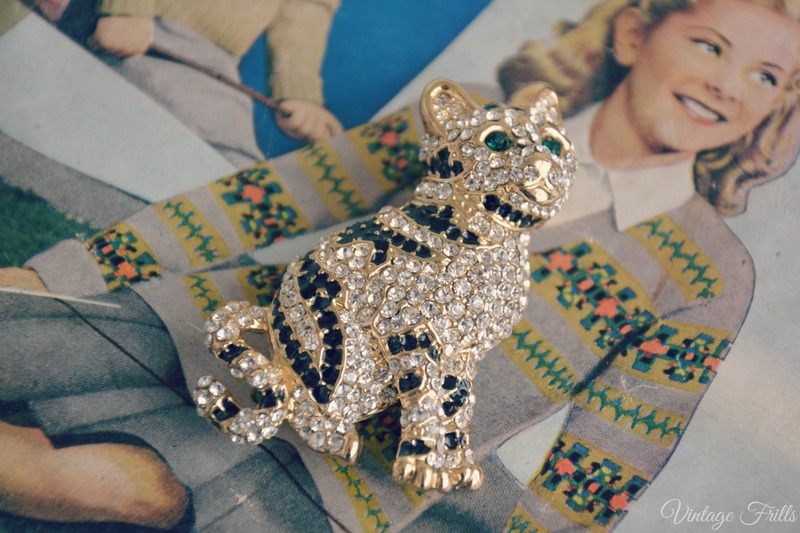 When I was recently asked to review something from the Eternal Collection website, I was delighted to see how many fun novelty brooches they had on offer and also that so many of them reminded my of real vintage pieces that I’ve admired from afar. 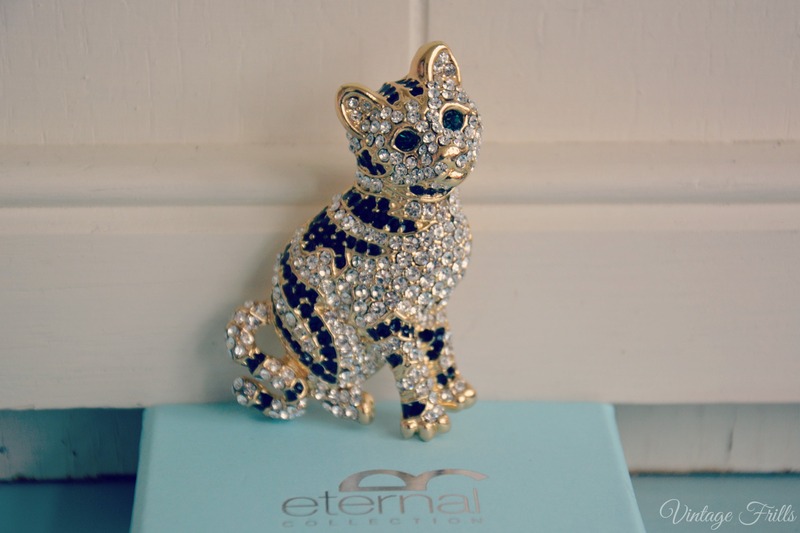 I was also tempted by their selection of clip on earrings, but in the end I just had to have this adorable jewelled cat brooch. I may have two cats lodging in my home, but I’m far from being a crazy cat lady UNTIL NOW! 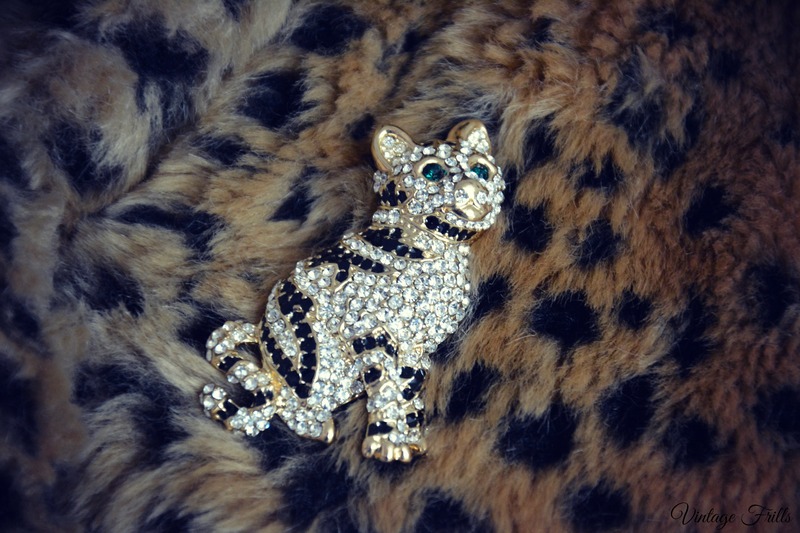 I’m sure this brooch has upped my cat loving status and I’ve been wearing in on my leopard print coat with pride ever since it arrived. I really really love it. It’s a little bigger that I expected so it’s not particularly subtle, but I think that’s a good thing, after all novelty items are there to be seen. I was really impressed with the quality of the brooch, which is absolutely smothered in clear and black Austrian crystals on a gold-plated background. I love the cat’s cute little green eyes too. At £25 I think the brooch is pretty reasonably priced as well. The brooch came in a pretty little blue box, carefully wrapped in tissue to ensure he arrived at his new home safely. I thought the lovely packaging would make him perfect as little gift for one of my cat loving friends of which there are many! If cats aren’t really your thing there are a plethora of other designs available on the Eternal Collection website. From flowers to birds to pretty little fans there is definitely something for everyone. The brooches and earrings are perfect for vintage lovers and I’d definitely like to pick up a few more pieces from the website in the future. Check out the full range on the Eternal Collection website. Aww, it’s absolutely adorable!!! I completely agree with you. Outside of the vintage fashion realm, it’s becoming increasing rare to see people sport brooches on a day-to-day (or even special occasion) basis. I don’t get it in the slightest! They’re affordable, whimsical, versatile, beautiful, the list goes on and on. I really started upping my own collecting about 3 – 4 years ago now and currently own over a hundred vintage and vintage inspired/classic looking brooches. I think a person could have ten times that amount and still keep searching for more though. There’s a seemingly endless array of awesome brooches out there and they each deserve to be loved and made part of someone’s wardrobe.